In many ways 2001’s Monsters, Inc. is a perfect example of a fully self-contained movie. The story of the film, from the opening sequence in the scare simulator all the way up to the one-word closing line, is perfectly complete. There are no loose threads, no hanging questions; absolutely nothing needs to be added. In fact, adding any more to that film could very easily serve to undermine the flawlessly told story at its center. That is why, when Pixar announced their intentions to release a follow-up to Monsters, Inc., I was terrified. Adding anything after “Kitty!” would only betray the impact of those closing moments of the film and retroactively devalue the original movie. Despite a couple of missteps recently, Pixar is still by my estimation the most reliable movie studio in the world and absolute trust in them is my default setting, yet when I heard this news it sounded like a stupendously bad idea. The later revelations that the movie would, in fact, not be a sequel, but rather a prequel focusing on Mike and Sulley’s college rivalry and eventual friendship, did assuage my fears to an extent, but I still had my fair share of reservations. After all, how many prequels can you count that a) are actually good on their own merit, and b) complement the original film rather than undermining its characters, its story, or its reveals? I’d wager not that many. I was optimistic, but I still had my concerns about how the film would turn out. I’m extremely happy to report that it turned out really well. As I stated earlier, Monsters University tells the story of how Mike Wazowski and James P. Sullivan met in the scare program of the titular college. Mike, who has dreamed for all his life of one day being a scarer, has worked hard to know all there is to know about the theory of scaring, however he’s not terribly scary himself. On the other hand, Sulley has an innate scariness, along with a family legacy of noteworthy scarers, yet he is perfectly content to coast along on his natural abilities without putting forth any effort to learn the craft of scaring. Through a series of circumstances the two of them end up entering the school’s Scare Games under the banner of the loser frat Oozma Kappa (OK), consisting mostly of rejects from the scare program. The main way that Monsters University succeeds where other prequels typically fail is that MU deliberately focusses on telling its own self-contained story rather than trying to retroactively setup the original film. This is a trap that so many prequels fall into. They try to work backwards from the standard sequel formula and stuff the film full of backwards setups and winking references to the original film (or films) in order to try and justify its own existence. They believe that if the new film constantly points to the original it will feel like it was always supposed to be there. It should be obvious why this never works. 90+ minutes of call backs to the original film does not a movie make; the references to the original should evolve naturally out of the new story being told, but instead the “story” is an afterthought, only there to fill in the blanks after they’ve run down the check-list of call backs. The Star Wars prequels are the most infamous example of all this. Those movies weren’t terribly concerned with telling a new story that complemented the originals, but rather felt like bad fan fiction trying to over explain every single thing that was referenced in the original trilogy, consequently making the whole Star Wars universe feel small and not nearly as full of possibilities as it once was. You never want to explain your joke, so to speak, yet that’s what most prequels spend their running times trying to accomplish. MU, though, never tries to explain the joke. This movie could have very easily gotten bogged down in an attempt to provide backstory to the corruption of the scream industry, the energy crisis in the monster world, and the ensuing conspiracy that were a primary focus of the original film, but thankfully it never goes that route. The only references to those ideas are subtle and exist only in service to Mike and Sulley’s college experience. Instead, the film spends most of its running time digging into the dynamic of Mike and Sulley’s rivalry turned friendship and the way those characters evolve into the versions we see in the original film. This is absolutely the right choice and it ends up being extremely effective. What this allows the movie to do is spend more time with characters we are already attached to and further develop our relationship with them; it complements the original film by giving us a deeper understanding of who they are as characters without needing to get caught up in explaining the story of the first movie. So we’ve established that Monsters University is a good prequel, but exactly how good of a movie is it? Honestly, I’d say it’s very good, though not quite as great as you hope might when it comes to a Pixar release. 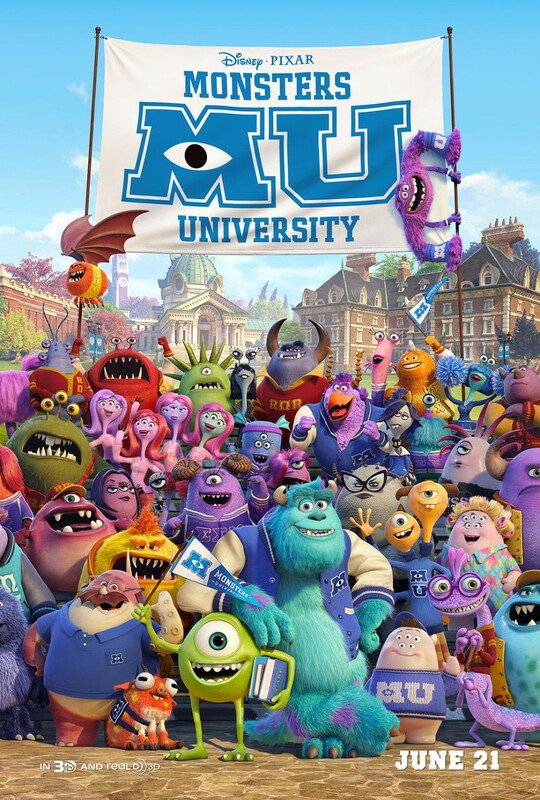 Monsters, Inc. is a decidedly better movie overall – it has a level of heart, originality, and emotional resonance that MU simply can’t match – but, that being said, Monsters University is a very fun film and an excellent comedy. As a pure comedy, this is, by my estimation, one of Pixar’s funniest movies. It takes a lot of the standard college movie tropes and filters them through the lens of Pixar’s monster universe; it’s not breaking a ton of new ground, but it’s familiar territory that is executed extremely well and with Pixar’s signature flair for strong storytelling and characterization. Aside from a handful of cameos, Mike and Sulley are the only two characters that return from the original film and both Billy Crystal and John Goodman reprise their roles. Despite almost 12 years having passed since the original film, both voice actors do a great job selling younger versions of their characters. This was something I was slightly nervous about, but I was very impressed by the fact that the combined performance of the animators with the voice actors allowed the characters to always feel appropriate college-aged. It never really came across like a pair of 60-something year olds trying to play 19, which, in reality, is more-or-less what it was. In addition to Mike and Sulley there’s a solid cast of new characters, the real standouts being the oddball members of Oozma Kappa. There’s Don Carlton, a middle aged sales monster who was recently laid off from his job and is returning to school; Squishy a small, gelatinous monster who hosts the fraternity out of his mom’s house; Terri and Terry Perry, a two headed monster, one of which is a dance major and the other is not; and, my personal favorite, Art, easily the most eccentric of the group. This is still Mike and Sulley’s movie, but their Oozma Kappa brothers do a great job stealing the show. The movie moves along at a brisk pace and always keeps you entertained with fun set pieces and wonderful gags, many of which are aimed at audiences who have experience with college. However, the movie also makes sure to carve time out for great moments of character development. The film may not have the same emotional punch that Monsters, Inc. had, but it has infinitely more soul than Cars 2, and though I won’t spoil it here, a major scene near the end of the movie is both extremely funny and deeply satisfying on a character level. It’s one of my new favorite Pixar sequences and, considering their history, that really is saying something. Monsters University was a movie that really had no reason to be made, but for a film that was wholly unnecessary it does a very good job justifying its existence. It’s very funny, has a good deal of warmth, and tells a worthwhile story without infringing on what made the first movie special. Perhaps most importantly it’s just a whole lot of fun. While it doesn’t aim to break new ground or challenge the concept of what an animated movie can be (something I really hope Pixar gets back to starting with next year’s The Good Dinosaur), it perfectly accomplishes what it set out to be: a fun movie that reunites us with some beloved characters. There are a lot of worse things than that. Now that I’ve seen the film I can say that I agree with your take. Monsters Inc. is a better film but I think Monsters University is funnier and can stand certainly stand on it’s own merits. It wasn’t the Cars 2 debacle I was afraid it might be.